What? Did you read that right? If you think I’m crazy, read on. Well, read on anyway. There are two main reasons why ABC has made steps to being more progressive, sure maybe not the most progressive, but definitely not the least. (#CBS) Those two reasons are Modern Family and The Oscars’ new host Seth MacFarlane of Family Guy. In a recent interview with Ty Burrell, he spoke about a new movie called Butter which is coming out this weekend, and how it takes a swing at typical prim and properness. On that subject, he touched on the subject of his show, Modern Family. It’s no secret that Modern Family features one of the most, if not the most prominent gay couples on television right now, and by far the funniest. No offense to the new normal, but Modern Family is funnier and they were the “new normal” before you were. Ty Burrell’s comments focuses on the idea that pop culture, including outlets like his show Modern Family, can truly help in the progression of social inequality. At first you hear a statement like that and think he’s a little bit up on a high horse, but his next comments make sense. He mentions how the couple of Cam and Mitch go through a lot of typical parenthood things on screen, and how that “normal” behavior sheds light on the idea of a gay couple being “normal”, and their loveable antics and wholesome outlook on life makes them better accessible. He even cited examples of people he knows in his family or just close friends whose conservative viewpoints have slightly changed over the years since Modern Family came on the air. Next up in this debate is The Academy Award for best new Academy Award host decision. 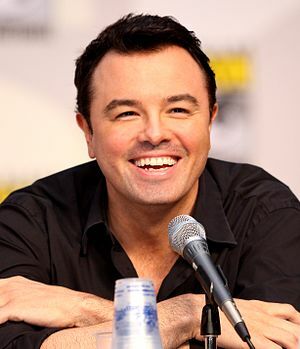 Seth McFarlane, despite what the head honchos say, was chosen to bring in a younger male audience, which has been lacking in the Oscar viewing demographic for years. However, I like the risk. Seth MacFarlane is not exactly a prominent figure in most other viewer groups. It’s likely his show Family Guy sparks something, but otherwise his name does not really ring a bell unless you’re a fan. Now, after hosting the season premier of Saturday Night Live, he’ll be hosting the Oscars. Seth MacFarlane can sing, and despite his dirty jokes on the show, he can actually be a very classy individual with refined tastes, much like the beloved dog Brian. I think it’s a fantastic choice on all levels, and ABC is doing well to approve some great new things showing on TV.